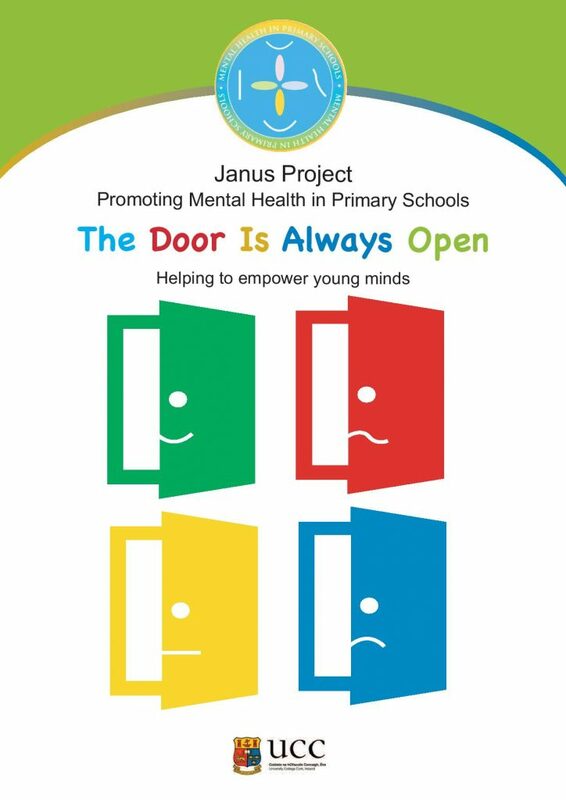 Taking inspiration from the mythology surrounding Janus, the Roman god of doors and gateways, this project’s main activity is titled ‘The Door is Always Open.’ Janus is often depicted with two faces, one looking back over the year just gone, one ahead to the year to come. Doors and gates, of course, do a very similar thing, serving the purpose of allowing one to pass through in either direction. The activity involves the literal opening of a ‘door.’ The door will be comprised of two sheets of paper. Glueing one border of an A3 sheet on top of an A2, with the intention of creating a hinge effect, the sheets will represent a door. The colours can vary, so long as there’s a good contrast between the door and its background, and the door and what’s behind it will need to amenable to being written on. Written on the front of each door will be the name of an emotion or an issue commonly experienced by primary school children. Written behind each door will be tips and hints on what to do when faced with the emotion/issue represented on the front of the door. The doors, in their closed state, with the emotion/issue in question written on the front, are presented to the children, who are then invited to discuss said emotion/issue. After some discussion and interaction led by the teacher/instructor, during which the children’s input on what to do is sought, they are invited to open the door and see what lies behind it, upon which they’ll see the advice and options available to them. Their own suggestions can be written in a space which has been left blank, and they can then discuss further the emotion/issue and given advice. There can be many, many doors, each one carefully chosen to reflect both classic and contemporary challenges, and many, many tips and hints. The literal opening of the doors is hoped to equip the children with the belief that, no matter what they’re facing, there is a place they can turn to for help, and in that place, the door is always open. The leap between literally opening a ‘door’ in the activity and figuratively opening a ‘door’ in the real world can be explained by the instructor if necessary, keeping in mind the idea that the children’s own understanding and suggestions will often be the best way of reinforcing the point. The activity can be scaled according to levels of ability: 1st and 5th class pupils can discuss different emotions and issues. Also, it’s very important that positive emotions and issues are well represented – in fact, they should be in the majority. For example, one ‘door’ could be labelled ‘happiness.’ The tips behind it could encourage the children to share their happiness with someone, listing off the possible people with whom they could do so. The suggestions should be somewhat neutral, as not all children have the same options – some won’t have mothers or fathers, or brothers or sisters, etc – so the following could be suggested: friends, teachers, doctors, grown-ups they like, as well as the aforementioned traditional options. Our questionnaire results suggest that another door could be labelled ‘bullying,’ which includes cyberbullying. The tips would encourage the children to take action about the bullying. The list of options could include: telling teachers/grown-ups about the bullying, doing it anonymously if they felt they couldn’t face someone, asking their friends to come with them to tell the teacher, not to believe what the bully was saying, to block people on social media, etc. A- That the exercise isn’t too prescriptive. That is, we don’t talk down to children and tell them exactly what to do. We allow them to make suggestions first, and once they have done so, we can fill in any blanks that might have been left. We need to value their input. And if they see their input being valued, they’re likely to get more out of the exercise. B -Focus on positives. Emotional problems and mental health challenges are what we’re seeking to prevent, but to do this, we must get children talking openly first. It’ll be a good icebreaker to get them talking about positive things, like happiness, things they like doing, people they like. And once they’re talking we then mix in the positives with the challenges. Such as starting with happiness, moving onto fear, then things they like doing, and alternating back and forth from there on in. D- 5 or 10 minutes, 2 or 3 times a week, would be plenty. Little and often might well be the key here. E- Try not to mention mental health in a blunt or direct way at first, although we still need to mention it explicitly in some way. We’re simply getting the children to talk about positives and challenges. We don’t need to cloud the issue too much at the beginning, or worry them unnecessarily, by talking about the unfortunate and more extreme mental health outcomes that befall some people later in life.